The Gary Fire Department operated two of these 1940 International pumpers.This one was assigned to Engine Co. 6, it had a 1000-GPM high-pressure pump with a 200-gallon booster tank. 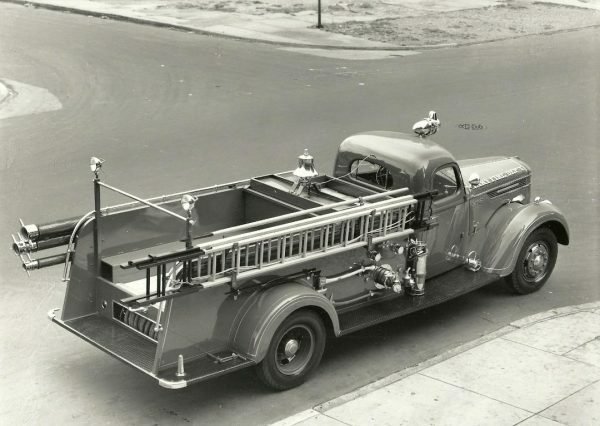 This entry was posted on April 11, 2019, 7:00 AM and is filed under Fire Department History, Historic fire apparatus, throwbackthursday. You can follow any responses to this entry through RSS 2.0. You can leave a response, or trackback from your own site. After further research I have found some updated info, this apparatus was a 1939 International / National / Hendrickson on a D series chassis. However I still cannot be sure of the maker of the pump. Any help on that issue would be greatly appreciated. I believe this apparatus was totally constructed by International Harvester on a Model D-50 chassis. I think it also had a Barton American high pressure pump. Notice the “red line” rolled up under the hose bed by the rear running board. Pretty discrete design for those times. I once had a ton of original Darley delivery photos and none were posed from above like this. I also noticed the number enscripted in the lower right corner which was indicitive of a delivery photo. Crabby, I’m guessing on Pirsch given that front bumper. However, the logo on each side of the pump panel doesn’t look like the Pirsch logo from the 60s on. It’s an IH chassis but any speculation on the rest of the apparatus? I’ll take a couple guesses and say either a DARLEY or PIRSCH. Mike G, the warning light / siren was a Traffik-King model developed and produced by the Federal Electric Company in 1939. It operated similar to the lazy 8 type Mars light. The box on top contained a motor to oscillate the reflector up and down and from side to side. I do remember seeing these lights on a few old GFD rigs. They were the state of the art for their day. 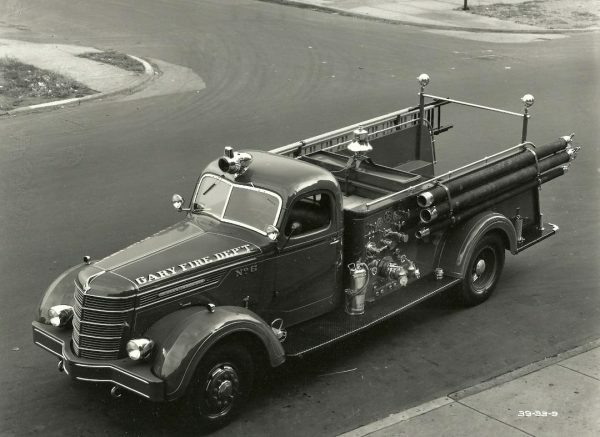 Awesome photos always enjoy the older rigs, love the location of the bell and what is that ontop of the siren? They worked hard to make it look like a custom chassis. Way to go Wayne. Very nice classic images.